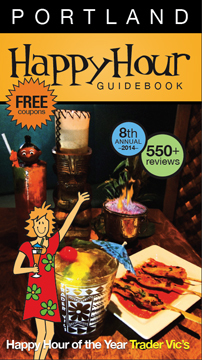 Get the Brand New Happy Hour Guide Book today. The new Happy Hour Guidebook is out and it’s filled with coupons, lists and everything you need to know to find the perfect Happy Hour. More a of Beer person? Don’t worry, she makes sure the breweries are listed in there with all the great food finds. Looking for the perfect Happy Hour in SE Portland? Or NW Portland? It doesn’t matter, she has got it covered by dividing the book up by location. The book is set up with a rating system that makes it easy to see if you are getting a good deal on drinks or a good deal on food. The perfect place has a good deal on both, and you will see that. I love Happy Hour because you are able to try some things off the menu for a fraction of the price, giving you an idea of what else the restaurant might have to offer. Plus with the coupons you can try things for even less. Now I am really going to sweeten the deal. I am giving away one of these books to one lucky reader. Tell me where your favorite place is to get Happy Hour for your entry. This giveaway will close on Feb. 6 at noon and winner will be announced later that day. Smallwares and Pix Patisserie. Beautiful food, great drinks and awesome deals! My favorite happy hour place is Portland city grill…fantastic food and a swanky atmosphere make it feel like a reward at the end of a long day! My current favorite for Happy Hour is Radar on Mississippi, was OBA!, and before that we liked SouthPark. I’m always looking for new yummy places. Love your blog! My favorite is Tea Zone and Camellia Lounge. Delicious, classy, and even more affordable during happy hour. TONS of choices, too! Thanks for the offer! My favorite Happy Hour is Tasty n Sons, great food and cocktails. I don’t make it to Tasty often because it’s across town in NE Pdx. My favorite SE neighborhood happy hour is HUB Hopworks on SE Powell. HUB is family friendly, especially with toddlers and preschoolers. They have plenty of space for big groups and families. It’s a good place to watch sports. The beer and food is delicious! HUB is my #1 happy hour spot. Pine State Biscuits happy hour is the one I crave most! The Box Social is a great place to go for HH! The deals and drinks are great, and even though the space itself is small (and box shaped…go figure!) there is always a table open to snag! Plus they have two Happy Hours (one 4-6pm and “Late Night”). Facorite happy hour is Casa Del Matador and Bartini! Currently, East Burn is pretty high on our Happy Hour list but always looking for new options.